The following Retouch menu tools on the Nikon D7500 camera enable you to level a tilting horizon line, eliminate lens distortion, and correct perspective. Leveling the horizon (Straighten tool): After you select the Straighten tool, an alignment grid appears over your photo, as shown. The yellow marker under the scale at the bottom of the screen shows the direction and amount of rotation. To move the marker, drag left or right on the scale or press the Multi Selector right or left. You can achieve a maximum rotation of 5 degrees. 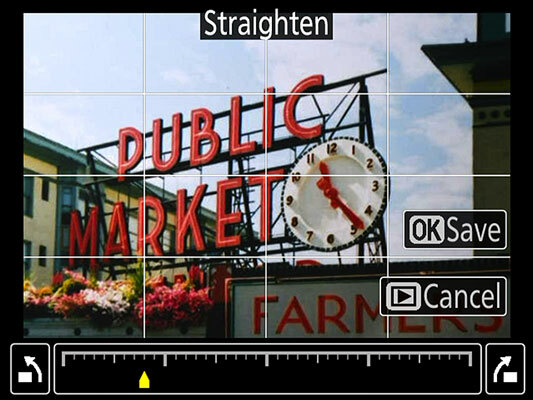 The Straighten tool offers a quick and easy way to fix a tilted horizon line. Removing barrel and pincushion distortion (Distortion Control tool): Certain lenses create barrel distortion, in which objects at the center of a picture appear to be magnified and pushed outward — as if you wrapped the photo around the outside of a barrel. Pincushion distortion produces the opposite result, making center objects appear smaller and farther away. Your camera offers two anti-distortion features. The Auto Distortion Control option on the Photo Shooting menu is designed to correct distortion as the picture is recorded to the memory card; the Distortion Control tool on the Retouch menu is available for post-capture editing. Auto: This option, like the Auto Distortion Control feature on the Photo Shooting menu, is available for certain lenses. If the camera recognizes your lens, it attempts to correct distortion based on its knowledge of the lens. Manual: If the Auto option is dimmed or you prefer to do the correction on your own, select Manual. A scale indicating the degree and direction of the correction appears under the photo. Use the Multi Selector to move the yellow marker along the scale until you remove as much distortion as possible. Correcting convergence (Perspective Control tool): When you photograph a tall building and tilt the camera upward to fit it all into the frame, an effect known as convergence occurs, causing vertical structures to tilt toward the center of the frame. Buildings sometimes even appear to be falling away from you, as shown in the left image. If the lens is tilting down, vertical structures lean outward, and the building appears to be falling toward you. Either way, try applying the Perspective Control tool. The original photo exhibited convergence (left); applying the Perspective Control filter corrected the problem (right). The photographer used the tool to produce the right image in the following figure. The D-Lighting tool brightens shadows without affecting highlights. After you select the tool, you see a grid over your photo and a horizontal and vertical scale at the bottom and left edges of the screen. Drag left or right on the bottom scale (or press the Multi Selector left and right) to move the out-of-whack structure horizontally. Drag up and down on the vertical scale or press the Multi Selector up and down to rotate the object toward or away from you. One important detail about these tools: In order for the camera to perform this magic, it actually distorts the original, tugging the corners this way and that to get things in proper alignment. This distortion produces an irregularly shaped image, which then must be cropped and enlarged or reduced to create a copy that has the same pixel dimensions as the original. That’s why the After photo contains slightly less subject matter than the original. (The same cropping occurs if you make these changes in a photo editor.) Framing your originals a little loosely ensures that you don’t lose important parts of the image due to the adjustment.